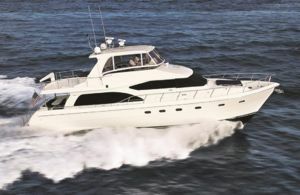 Hampton Yachts is proud to announce the introduction of the Hampton 680 Pilothouse. 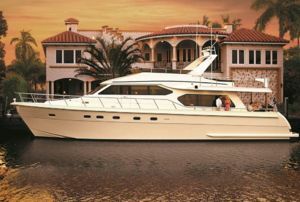 Like all Hampton yachts, the Hampton 680 is designed and built for comfortable, safe, and dependable cruising. The attention to detail in every facet of construction on the Hampton 680 is what every discerning yacht owner would expect in a semi-custom yacht. It continues to reflect Hampton Yachts' uncompromising commitment to superior yacht design and construction. Hampton's in house design team has spent many years refining the Pilothouse yacht concept. This solidly built cruiser with covered side decks features furniture quality interiors custom designed to each owner's specifications. The wide 18' 2” beam on the Hampton 680 allows for large and comfortable living space with luxurious amenities. The planing hull of the Hampton 680 incorporates a modified deep-V design with high forward deadrise sections for a smooth entry in head seas and flatter aft sections with reverse chines to provide an efficient planing surface, resulting in a comfortable, stable, and safe ride. This hull design also incorporates propeller tunnels to lower the propeller shaft angle for greater efficiency and directional stability. The 100% hand laid fiberglass hull is molded in one piece with five outer layers of vinylester resin for blister resistance. The hull is solid fiberglass reinforced with 2 layers of Kevlar from chine to chine and 3 layers of Kevlar in a forward collision zone. The deck, deckhouse, and flybridge are cored with high strength "Divinycell" using the "Vacuum Bag" construction technique for maximum strength to weight ratio. The pilothouse of the Hampton 680 offers excellent visibility. The large instrument panel allows for easy installation of the latest instrumentation and navigation equipment. A settee, with an adjustable table and burl inlays, offers a comfortable place to sit and converse with the captain while under way and can also be converted to a dinette for six at the dock. The flybridge offers a large seating area with adjustable table, helm bench, jump seat, wet bar, refrigerator, and BBQ space. The main salon of the Hampton 680 offers flexibility for each owner's customization. The owner has the option to choose freestanding or built-in furniture from standard floor plans, or you can work directly with Hampton's in-house design team to create your own design. The salon is equipped with the very latest in high-tech audio and video entertainment equipment, including a 37" HD/ LCD TV and Bose surround sound system. The galley, located amidships on the upper deck, enjoys ample light from the pilothouse windows and has access to both salon and pilothouse. Premium appliances are complemented by the owner's choice of Corian or granite countertop and top quality fixtures. The Hampton 680's 18'2” beam allows for three staterooms, each with ensuite head. Hampton's design team has spent extensive time, both on the computer and in the yacht itself, to ensure maximum utilization of the interior space. Our craftsmen custom-create the built-in dressers, nightstands, and vanity spaces that adorn each stateroom. The master stateroom features a king size bed with excellent storage space and cedar lined hanging lockers. The master head has a whirlpool tub lined with Corian. Premium quality faucets and granite or Corian countertop are used. Each guest head also features a beautifully designed enclosed shower stall. The VIP stateroom is forward with a centerline queen size bed and abundant locker and drawer space. The third stateroom can be converted to an efficient and private office space. The optional crew quarters and utility area features a separate head and shower, space for washer and dryer, countertop for folding laundry, work bench with stainless steel top, and tool storage. An aircraft style door in the transom leads to the large swim platform, and easy access is provided to the engine room that has been carefully designed with an emphasis on serviceability.